A Night at the Cotton Club! 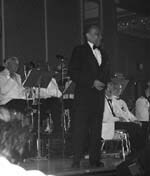 Friday April 19 2002: Tom and Debra brought Fayard Nicholas of the Legendary Nicholas Brothers back to the stage at the Reston Hyatt. More than 600 folks had the time of their lives as The Tom Cunningham Orchestra under the direction of Bill Eliott laid down track after track of fantastic music. For this reviewer, at least, THIS is what swing dancing is all about. Folks generally looked their best in vintage and formal, and there is something, some rare essence about dancing in a big room to a big band that just cannot be captured anywhere else. Fayard's performance included musical numbers from the 1920s through the 1950s with acknowledgements to all the greats that he knew and helped including Gene Kelly, Donald O'Connor, Fred Astaire, Betty Grable, Eleanor Powell and Ann Miller. His rendition of "Make 'Em Laugh" was especially poignant because Donald O'Connor used this number as an Homage to the Nicholas Brothers in the film Singin' in the Rain. Click Here to read more about Fayard's incredible career! The evening gave us a rare treat -- we got to hear Fayard sing a medley ranging from ragtime to hot swing to Broadway musical. 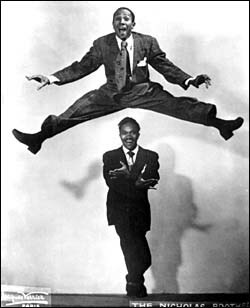 The Nicholas Brothers are best known for their film work which generally excludes their singing --- the reason being that non spoken parts by African American artists could be legally excised for showing in the racist South. In fact for their entire career, the Nicholas Brothers' nightclub act featured as much singing as dancing and both brothers were known as song stylists. Those of us who came to the Reston Hyatt were privilaged to witness something that has been obscured from an entire generation. Fayard and Harold named their autobiographical film We Sing and We Dance --- that was the theme of the evening. The 87 year old Fayard began his performance seated in a chair; during the performance, he magically melted the years away until he did a rousing version of Chattanooga Cho Choo with his wife; he ended the show by leading a massive Shim Sham. What a trooper! We don't want to forget the Big Guy who kept the sounds pumping out for the entire evening. The band looked great in white dinner jackets and sounded fantastic. The Cunningham band is really hot now and is not to be missed! George Gee came all the way from New York. He announced that his lovely wife is expecting a new addition to the family. Mazel Tov! Debra Seemed to have a ball! Tom watched most of the performance with Little Thomas in his arms. What a great memory for that little kid! Thanks to Deb and Tom for organizing this wonerful event. I want to thank Chrissy for sending me these digital images so quickly! By the way, you can see more of Chrissy in our article about the Art Deco Society Fashion Show. The Original Cotton Club was owned by gangsters. This evening, the underworld made a showing as well. Arthur "Lucky" LaRue of the Dutch Schultz Mob made an appearance with his moll, Belle. Also in attendance from the Luciano Family was Umberto "Clams" Casino with his dame, "Peaches" Melba. The mob seems to have lost some of its cachet; both LaRue and Casino are CPAs with a big 7 accounting firm. LaRue quoted Willie Sutton, saying: "We go where the money is."